Mexico is a country known for its architectural beauty, sacred ruins, natural wonders, and coastal communities. 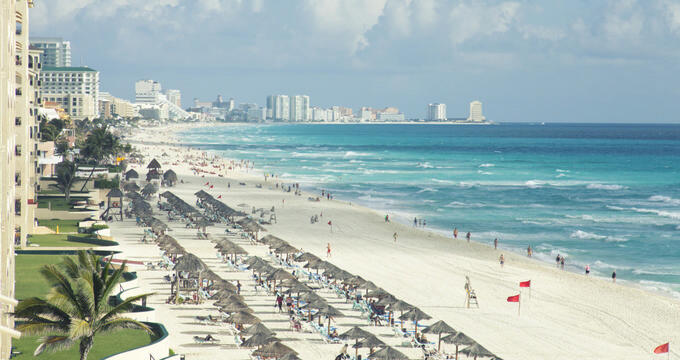 It is also home to some of the best all-inclusive resorts in the world from the enviable Riviera Maya to the emerging Riviera Nayarit, Mexico makes family vacationing easy. 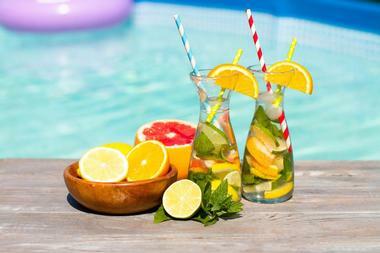 These virtual home-away-from-home-style accommodations typically feature several expansive pools, luxury spas, fitness and wellness centers, business centers, kids’ zones, and adults-only areas. They include complimentary food and drink at each of their restaurants and bars. Additionally, various on-site activities, performances, non-motorized aquatic rentals, and tour opportunities are also included, ensuring fun for the entire family. Nestled along the coast where the Yucatan jungle meets the Caribbean Sea, the Grand Velas Riviera Maya resort takes the all-inclusive experience to the next level. It’s a place for guest’s to indulge in gourmet cuisine from award-winning chef’s, to rebalance their mind and body at their holistic spa, and to unwind by their sparkling pools with uninhibited scenic ocean views. 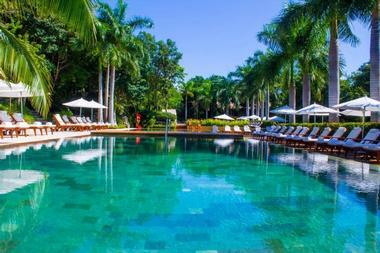 A resort that has re-designed luxury, they feature three distinct suite styles. Zen Grand Suites, tucked away in the Mayan Jungle; Ambassador Suites, the beachside, family-friendly option; and the adults-only Grand Class Suites. Each features a contemporary Mexican design, 24-hour room-service, modern amenities, and attached balconies or patios with picturesque views. 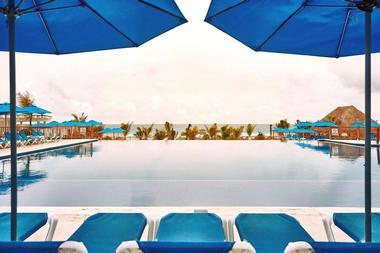 AZUL Beach Resort is located in Mexico’s enviable Riviera Maya, along the beautifully serene coast of the Caribbean Sea. 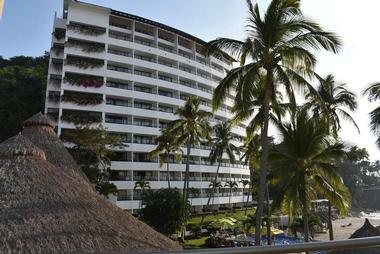 This award-winning resort is equipped with 435 oversized luxury suites boasting an elegant design inspired by the sea. Gorgeous mahogany furnishings complement crisp white linens and vibrant turquoise accents. An open, airiness is created by their sand-painted walls, large picture windows, and floor-to-ceiling sliding glass doors that open onto expansive patios. An array of onsite amenities and activities are available for both adults-only and family-centered guests. This includes various swimming pools, a fitness center, several restaurants and bars as well as cooking classes, Spanish lessons, Nickelodeon activities, numerous sports courts, and non-motorized watersport rentals. 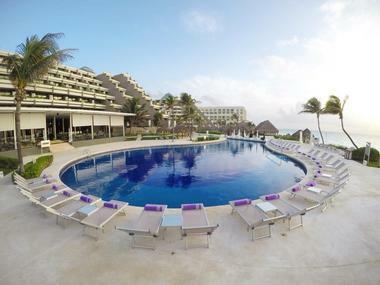 Nestled along the beach in Cancun’s Hotel Zone, Beach Palace Cancun is an award-winning all-inclusive resort ideal for romantic couples and families. 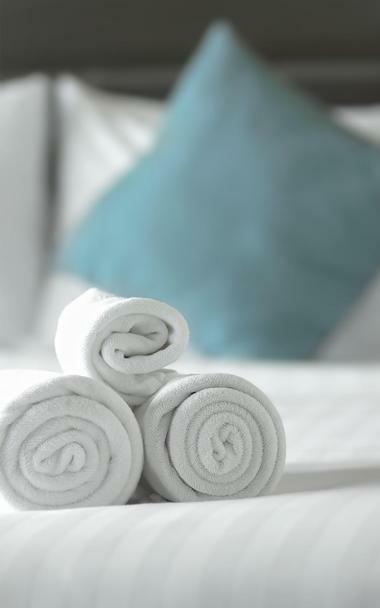 They provide over 280 guestrooms and suites stylishly decorated with contrasting woods and high quality linens. Each room is equipped with double whirlpool tubs, luxury CHI bathroom products, complimentary mini-bars, LCD televisions, free Wi-Fi, and large balconies providing extraordinary scenic views. The resort also boasts an array of amenities and activities including their four distinct restaurants, a full-service spa, three outdoor swimming pools, a children’s pool, a children’s club, 24-hour fitness center, and a business center. 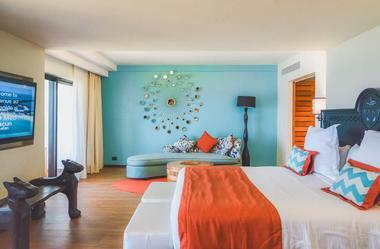 Newly redesigned, Club Med Cancun Yucatan is the Riviera Maya’s ultimate all-inclusive family resort. Located on a private peninsula, the resort is bordered by three white-sand beaches including the second largest coral reef in the world. The resort’s standard guestrooms are housed in Mexican hacienda-style buildings boasting bright and airy interiors with grand balconies and terraces overlooking either the garden, lagoon, or Caribbean Sea. 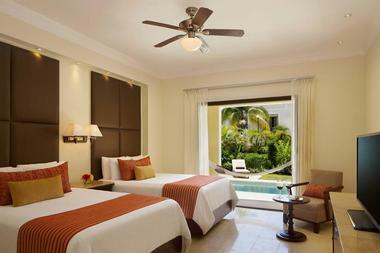 They also offer upgraded luxury accommodations in their 5-Trident Suites on a secluded part of the grounds. Club Med features numerous dining options and bars, swimming pools, and a variety of land and water activities for guests to indulge in. Situated between the Pacific Ocean and the Sierra Madre Mountains, Club Med Ixtapa Pacific is a gorgeous hacienda-style, all-inclusive resort. The hotel features two guestroom styles – Club and Deluxe, as well as a selection of suites ideal for families and couples. Each are elegantly designed in a contemporary style boasting plush, oversized furniture, eclectic colorful furnishings, and modern in-room amenities. Club Med offers all of the onsite amenities expected of all-inclusive resorts including several restaurants and bars, expansive swimming pools, and spa services. In addition, they provide several small, special touches such as nightly turndown service to make each guest’s stay a memorable one. Cozumel Palace is an opulently designed all-inclusive resort located in the city that shares its namesake – Cozumel, Mexico. It’s the perfect destination for couples and families, but a heaven on earth for watersport enthusiasts and ocean lovers. The resort offers a variety of water excursions such as snorkeling and SCUBA diving right off their dock. After spending hours in the sun, guests will relax in their well-appointed guestrooms that serve as a sanctuary of splendor boasting expansive beach-inspired interior décor with hammock adorned attached balconies. The hotel’s on-site restaurants provide an array of varying flavors including Pan-Asian, Italian, and Mexican in a variety of casual and upscale dining settings. 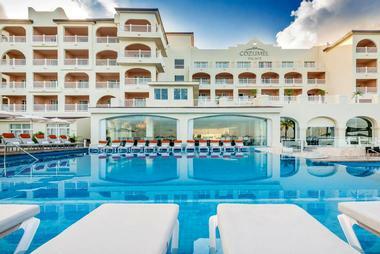 Crown Paradise Club is a modern and sleek all-inclusive resort located in Cancun’s Hotel Zone. 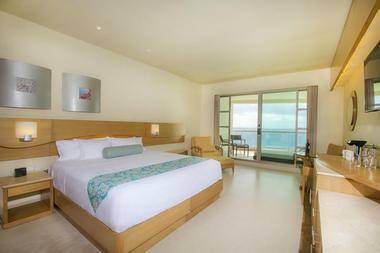 They feature 617 guestrooms and suites, all of which include a private balcony with scenic ocean views. The hotel’s amenities are just as luxurious as the accommodations with a buffet, six à la carte specialty restaurants, sports courts, a gymnasium, mini golf area, a disco dance club dubbed Nitro, an adults-only area, and two separate fun zones for children. They also provide guests with a wealth of services such as the use of non-motorized sport equipment, live entertainment performed nightly in their theater, exclusive areas for adults, and an activities program that includes yoga and water aerobics classes. Situated on a secluded beach boasting sugar-white sand, Dreams Tulum Resort & Spa is an award-winning resort in the ancient town of Tulum. A whopping 44 acres, this expansive all-inclusive resort features a rustic design surrounded by lush, blossoming gardens. Soothing neutral tones beautifully complement dark wood finishes, colorful accent pillows, and modern amenities in each of the guestrooms. Guest’s will enjoy an even more palatial atmosphere when staying in their luxury suites boasting hardwood floors, antique mirrors, and vintage-style chestnut wood furniture. On-site resort amenities include nine different gourmet dining experiences, a world-class spa, a selection of pools, a wide range of activities for the entire family, and access to various tour opportunities. Hyatt Ziva Puerto Vallarta is an all-inclusive resort situated on the private Las Estacas Beach, surrounded by majestic cliffs. Each of their more than 300 luxury guestrooms and suites feature a modern design decked out with lavish designer décor, white marble bathrooms, and attached balconies with lovely scenic views. Comfortable sitting areas, rainfall shower heads, hydro-massage bathtubs, and large HDTVs as well as in-room complimentary beverage centers and Wi-Fi are just a few of the amenities in each of their accommodations. Club level accommodations add even more perks. The resort itself provides an abundance of amenities such as a tranquil spa, several seaside pools, eleven unique bars, restaurants, and lounges, and an array of free activities and live entertainment. Located on Mexico’s Pacific coast, along the Riviera Nayarit near Punta de Mita, Iberostar Playa Mita is an all-inclusive resort providing families with relaxing contemporary accommodations and an endless number of activities. This includes complimentary and unlimited access to a variety of non-motorized watersports such as windsurfing, kayaking, and beach volleyball. They are also adjacent to Litibu Golf Course, a renowned 18-hole course with 362 yards of lush greenery and striking oceanfront views. Iberostar Playa Mita is also known for its diverse selection of mouthwatering international cuisine and cocktails provided by their Nopal Buffet, four specialty restaurants, and eight bars. A splash park, discotheque, gym, library, spa, and shopping area can also be found on the grounds. 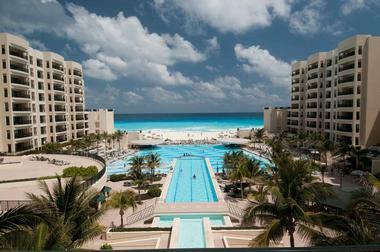 Moon Palace Cancun is an all-inclusive resort situated in Cancun along the Riviera Maya. Located just steps from the beach and adjacent to a renowned 27-hole golf course designed by legendary golfer Jack Nicklaus, Moon Palace provides a wealth of outdoor activities for the whole family to enjoy. The resort also features two lagoon-style swimming pools, a children’s pool, a state-of-the-art gym, full-service luxury spa, 15 restaurants, and 12 bars. Each of their guestrooms boast a modern design utilizing earth tones, dark wood finishes, and marble bathrooms with two-person spa bathtubs. 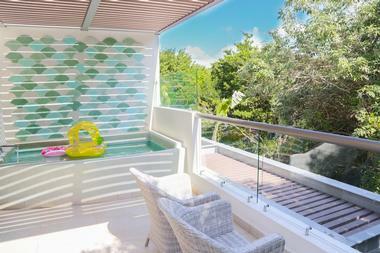 Guests also gain access to the resort’s sister properties located in Cancun. Paradisus Cancun Resort is a luxury all-inclusive resort situated in Cancun along the beautiful coastline of the Caribbean Sea. An award-winning, four diamond hotel, Paradisus features spacious and elegantly decorated guestrooms with attached balconies. The resort boasts lagoon-style swimming pools, nine on-site restaurants, tennis courts, a nine-hole golf course, YHI spa, and Kids Club. Families looking to upgrade their experience may want to try to book the Family Concierge exclusive services. They foster family bonding with specially appointed Family Concierge suites that feature special in-room amenities for parents and children alike. Cookies and milk turn-down service, luxury bathroom amenities for parents, and 24-hour PS2, Xbox 360, and Wii rentals are also included in the experience. A Riviera Maya all-inclusive resort, Sandos Caracol Eco Experience is an expansive resort with three guestroom sections, Family, Royal Elite, and Select Club Adults Only. Each area has been specially designed to cater to their specific demographic. The Family section resides in villa-style buildings featuring a rustic yet modern design and décor with attached patio or balcony showcasing jungle and/or pool views. This area of the resort features family-centered amenities including an Aquapark, Kids Club, main pool, chill out pool, water sport center, sports courts, a buffet restaurant, several à la carte restaurants, and few bars for the parents. 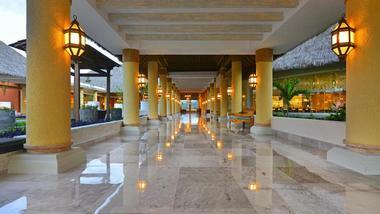 There is also a fitness center, Spa del Mar, a shopping area, various snack areas, and nightly live performances. 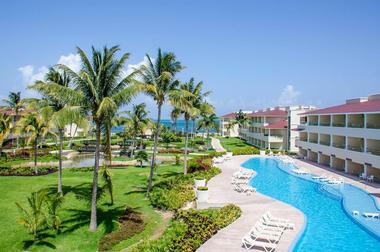 Seadust Cancun Family Resort is a premier all-inclusive resort along the Riviera Maya in Cancun. It features 505 sleek and modern suites boasting nautical décor with expansive attached balconies overlooking the Caribbean Sea. The property has 11 incredibly delectable restaurants including the Lighthouse Restaurant, known for its mouthwatering lobster and the Splash Bar’s Deck, a romantic eatery for parents who utilize the hotel’s babysitting services. Kids will enjoy the resort’s theater that showcases nightly live shows and their Treasure island Water Park. Seadust also features a mini-golf course, zip-line, climbing wall, playroom, main pool, sport courts, beach activity rentals, and a gym, sauna, and steam room. 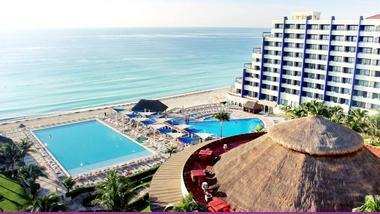 The Royal Sands Resort & Spa is an all-inclusive resort situated in Cancun. All of their well-appointed guestrooms feature stunning views of the Caribbean Sea and provide an array of modern amenities. This includes their Master Suites equipped with two bedrooms, two bathrooms, a dining/living room, fully equipped kitchen, and grand terrace. It’s the ideal option for families. There are nine incredible restaurants on the property covering a wide range of global flavors including Mexican, Italian, Japanese, and American. They also have several bars including Sidelines Sports Bar with pool tables, various swimming pools, a state-of-the-art gym, luxury spa, Kids Club, and a recreational activities program.